Paschim Medinipur and neighbouring Jhargram districts in West Bengal have been witnessing incessant rain since Thursday night. 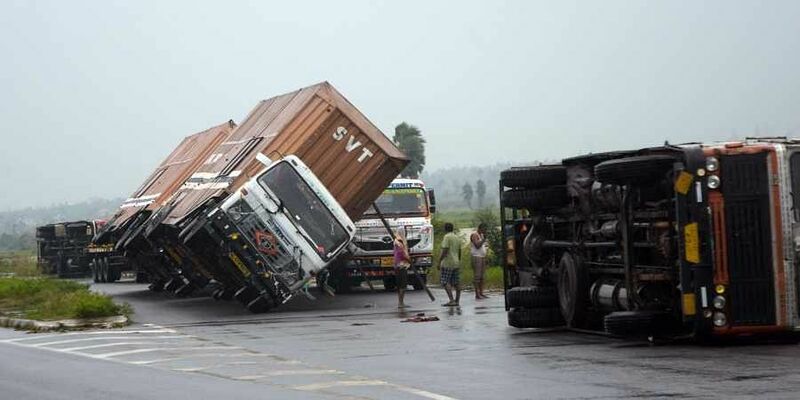 KOLKATA: Cyclonic storm Titli left a trail of destruction in two districts of West Bengal on Friday, killing one person and injuring 10 others, even as it weakened into a deep depression while moving northeastward. The meteorological department has warned of heavy to very heavy rainfall in the Gangetic West Bengal till Saturday. A 35-year-old security guard was killed when a 12-foot factory wall collapsed on him at Kharagpur in Paschim Medinipur district. Ten others were injured in various rain-related incidents, District Magistrate P Mohan Gandhi said. In neighbouring Jhargram too, several mud houses and Durga Puja pandals collapsed owing to cyclone Titli, officials said. According to the meteorological department, the storm system is very likely to further lose steam and turn into a depression as it moves through Odisha and enter the Gangetic West Bengal after recurving northeastwards following landfall at Gopalpur in Ganjam district of Odisha. It is, however, likely to cause heavy to very heavy rainfall in the Gangetic West Bengal, with North and South 24 Parganas, East and West Midnapore, Jhargram, East Burdwan, Howrah and Hooghly districts to be affected the most. Heavy rain also is likely in Kolkata, Bankura, Purulia, Birbhum, Murshidabad, Malda, North and South Dinajpur districts till Saturday. Fishermen have been advised not to venture into the sea along and off the coasts West Bengal and Odisha, deep sea areas of north and the central Bay of Bengal till Saturday owing to rough to very rough sea condition.